Sechrist Air / Oxygen gas mixers provide for precise mixing of air and oxygen for many clinical applications. Sechrist Air/Oxygen gas mixers provide for precise mixing of air and oxygen for precise clinical applications. 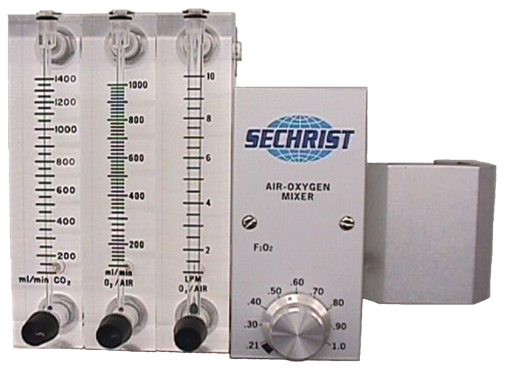 Sechrist Air / Oxygen gas mixers Model 20090 provides for precise mixing of air and oxygen for many clinical applications. The Model 20090 gas mixer is specifically designed for ECMO or Heart-Lung Bypass applications. For export only. Not sold or offered for sale in domestic commerce. Not CE marked. *NOTE: Mixers will maintain the delivered FIO2 within + 1 percentage point of the selected value even with fluctuations in supply pressures. An additional 2% variance may result from the readability of the set point and scale error. Send email to request Products Package and information.